THE BOOK OF SAMOTHRACE are available directly from Windsor-Smith Studio. Click the print image to see a close-up detail. 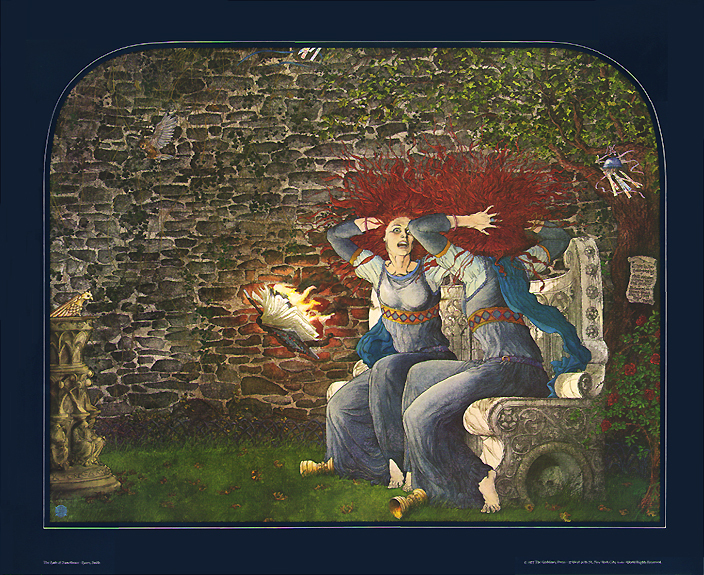 These vintage prints are from the 1977 limited first printing. and can be signed at the purchaser’s request. There is no additional charge for the signature. THE BOOK OF SAMOTHRACE is 24 x 30 ” on 10pt. enamel cover stock. The price for each print is $100, plus $20 for insured Priority Mail shipping, within the U.S.
International orders please e-mail us for shipping prices. about customs duties on our Galleria TERMS page. payable to, and mailed to, Windsor-Smith Studio, P.O. Box 1195, Kingston, NY 12402, USA. We also accept payment, including with credit cards, through PayPal. that the print will be reserved, with shipment held for 10 days while the check clears our bank. Shipment for money order, cashiers check, and PayPal orders is generally within 5 days of receipt. E-mail us using the button below to reserve your copy of THE BOOK OF SAMOTHRACE.